In my opinion, there’s no need for a light rail that runs basically parallel to the G train. The area could use more/better transit, but not a $2.5 billion light rail for a line that runs parallel to one of the most lightly used subways. The money would be better spent elsewhere in the city: somewhere else in Queens or Brooklyn, in the Bronx, or on Staten Island. For this area, improving service frequencies on the G train and introducing an SBS route would be more than enough. The city could use it’s position as a political figure to act as a champion on behalf of it’s residents to demand (and work with) the MTA to get it’s act together. A lot can be done with $2.5 billon: improving subway/bus service, working on 2nd Ave or whatever the next megaproject is, or dropping commuter rail fares within the five boroughs. We don’t have time for political catfights, we need improvement. Since that would be way too nice and without some real change we aren’t getting such nice things, such reasonable decisions, the next best thing is for those advocating for light rail on Staten Island to find a political champion in the city or state government. Giving up won’t solve anything, but taking more action, better action, being smart about this, and letting your voice be heard, will create a bumpy but feasible path toward west shore light rail for those who are willing to travel it. 1) The G train doesn’t go near the waterfront. 3) The waterfront area is expected to see tremendous growth over the next decade with more than 100,000 new residents and jobs. It’s ironic that no one is talking about the future here, given the lament that I normally see on this forum towards the failure of city officials to plan for a growing city. I’m not saying that this is the best transit plan ever created; it’s not. But I am surprised by the vitriol. This light rail proposal is low hanging fruit; it doesn’t rely on the MTA and can easily pay for itself. Moreover, it can demonstrate the viability of this transit medium and can spur the growth of this transport mode. It seems like a big win; if it’s executed correctly. The G train stop at Greenpoint Avenue is three blocks from the East River. New York City and the state are run by pandering left-wing jack-holes. Maybe if residents of Staten Island voted Democrat they’d have their light rail by now. You mean if Staten Island isn’t comprised of right wing, Donald Trump loving car lovers and mass transit haters then they would have their light rail by now. Staten Island votes both Dem and GOP depending on the candidate, and doesn’t slavishly pull the Dem lever all the way down the line like the other boroughs, where subway slashings and $3000 studio apartments are the norm. And BTW, Staten Island voted for Obama in the last prez election, so please keep your ill-informed views in Brooklyn where they belong. The candidate usually just needs to be an authoritarian, provincial slopebrow and Staten Island will support it. That’s an ugly, useless way to be nonpartisan. Just be a Republikan. That goes for de Blasio fans too: you may as well just support Giuliani. The outcomes are about the same. Also agree. Pro-LRT voices may need to revisit the approach or otherwise reconnoiter, but giving up is fickle (and facile). It’s a slog, a marathon, to any finish line when it comes to surface rail here in the Northeast. I would urge local backers not to attack the BQX (streetcar) proposal directly (regardless of its merits). That just smacks of parochialism (and invites comparison, not necessarily an automatic plus). Instead, emphasize why Staten Islanders want and need LRT — take a proactive approach, as it were — even as one does the inevitable (and often distasteful) political dirt moving Mr. Kabak properly recognizes. Why aren’t these people fighting for light rail on the North Shore? There is a ROW on the North Shore. There is intersection with another rail line and the most important mass transit link off the island. They are fighting the wrong battle. The North Shore should be getting light or heavy rail and the west shore should be getting BRT or nothing. These people are fighting for the opposite. Staten Island and New York City are in a bad marriage. This bad marriage needs what every bad marriage needs: a divorce. Why must we New Yorkers be saddled with this section that does not identify with us, does not want to be a part of us, and provides nothing but distraction and obstruction? It is long past time to call a halt to this union which does not serve our interests (and which, according to that benighted isle’ noisemakers, does not serve theirs, either). Staten Island voted to secede a couple of decades ago. New York City should have honoured that wish then; and we should do so now. Is there no way to effectuate this? Would the State accede to this if the City were to agree? Why not just upzone the island? A fine solution, if that’s what the people of Staten Island wanted. But its pretty clear that they don’t want urbanisation, and that they don’t want density. In short, they don’t want to be part a city. So let’s just give them what they want. Maybe they do. The media and community boards are each terrible gauges of that around the whole city. I propose a trade between NY and NJ: Richmond County for Hudson County. Much of Staten Island’s population growth came from Brooklyn. Many of them Italians from the southern end of the borough once the Verazzano Bridge opened. Brooklynites (not the transplants of the past 20 years) also thought they (Brooklyn) should have remained their own city. I’m sure Manhattanites would vote to secede too.. That really doesn’t mean anything. It’s not moving to New Jersey. It’s been a part of NYS for hundreds of years. No it won’t vote to become it’s own county in NYS when they realize they would end up with nothing. The real “problem” with Staten Island is that it’s not connected by rail to the rest of the city. New York City consists of FIVE counties – New York County (Manhattan), Bronx County (The Bronx), Kings County (Brooklyn), Queens County (Queens) and Richmond County (Staten Island). Staten Island, like the other boroughs had been a county BEFORE the founding of the Greater City Of New York by a vote in 1894. Just to be clear, there was only a 400 vote difference in Brooklyn between those to wanted to join the city of New York (then Manhattan and some parts of the Bronx), and those who wanted Brooklyn to remain its own city. Staten Island overwhelmingly decided to become a part of the Greater City Of New York. The “county status” of each of the boroughs has remained in effect before and since that vote. No such further votes by the residents or acts by the state legislature would be needed. Staten Island like the other boroughs is ALREADY AND HAS BEEN AND REMAINS A COUNTY! The discussions on secession that took place in the early 1990’s still would not have had any effect upon Staten Island’s status as a county, or upon the “county status” of any of the other boroughs. They are a county but they are not independent. My point is when push comes to shove and they have to stand on their own in Albany- that idea would be vanquished. I never said they should secede – so I’m missing your point. My comment was stating that in spite of the angst – it wouldn’t really happen. Not sure why you brought up the original vote in the 1890’s since I’m sure they are all dead and the world is very different now. In your first message you said: “No it won’t vote to become it’s own county in NYS…” which seems to imply that Staten Island IS SOMEHOW NOT A COUNTY NOW! In your second message/reply you said: “They are a county ..” which seems to suggest that you now know that Staten Island is a county. Too many times to count online folks seem to think that Staten Island exists “some place out there”. Would Staten Islanders vote to separate from NYC? Probably not – simply because they repeatedly voted in very large numbers for Rudy G. and Mayor Bloomberg – who responded to their needs. Too many on the island expressed the viewpoint that they did not like Mayor Dinkins! Yes – it is true that Mayor Dinkins – did not place Staten Island on a high list of his priorities. The closing of the landfill, the improvements with the ferries and terminals, and lowering of bridge tolls, among other actions by these officials improved their standings among Staten Islanders. I know that Staten Island is often considered to be the “forgotten borough”, and simply too many times online – especially on transit websites – the usual collection of transit topics are continually brought up again, and again. I agree with you – the “one” problem with Staten Island – transportation wise – is that it is not connected to the other boroughs by subway transit. I fully agree that transportation on Staten Island needs to be much better in so many ways! Well pardon me – I should have included “independent” with the word “own”. I figured on this site everyone would know what I meant. In Albany – none of the boroughs is really looked at independently. But yeah it is “forgotten”. In reality it is Manhattan – then Brooklyn… Trailing far behind is Queens. The Bronx? Looked on with scorn by most. SI barely even registers a response. 1) Staten Island has nearly 20% of the city’s land; almost as much as Manhattan and the Bronx combined! But it has less than 5 percent of the population. That’s most likely because there is no subway access. If the mayor were serious about affordability, he’d push for a subway to Staten Island coupled with an up zoning. The massive influx of development would easily affect the supply of housing. 2) The tunnel should really directly connect lower Manhattan with St. George. The Transbay tunnel in SF about 6 miles long and there are many longer tunnels in the world. Even at $1.5 billion per mile, the economics would be easy to justify; the increase in tax revenue from the rapid development of Staten Island would be a boon to the city. 3) It takes longer to get from Port Richmond to Midtown than to get from Stanford to Midtown… think about that. Very well said. Would be very interested to hear Ben’s take on this. If it’s possible to build it as an extension of the E that would be even better (the SIR uses IND rolling stock and would require the least modification to SIR stations). When we talk about “net neutral” investments like this light rail proposal, the return on investment by making Staten Island mere minutes from Manhattan via a modern Trans-bay tube has exponentially more potential than the waterfront light rail that’s on the table. If they built a station on Governors Island, the city could sell the land to the highest bidder to be developed – just that revenue alone would help pay the cost of building a trans bay tunnel. The tax revenue and economic activity as the result of a big upzoning and development on Staten Island would be a net profit in the long run, even if this project costs $8-10 Billion. Governors Island can’t be sold and housing can’t be built there. That’s part of the agreement to get control from the Feds. If they were to extend the E train they wouldn’t just tunnel from Manhattan to SI. You could use the additional capacity of the existing tunnel to build out the line through western Brooklyn. Compared with Brooklyn, Staten Island already has received massive transportation investment per person. Unfortunately or fortunately, depending on your point of view, that investment was more lanes on the Staten Island Expressway. Living here on SI (New Brighton, by the ferry), I find it ludicrous that there is no transit, outside rush hour, between any part of the island and New Jersey. It’s also ludicrous that the only way off this island is riding Bill DeBlasio’s yacht either at the top or bottom of the hour. Equally ludicrous is that fares are only collected on the train here at the first three stops, buses are always late to St George, and that it takes 30 minutes by car to get to a bridge to get to Jersey or Brooklyn. From what I can see, there’s more merit in the HBLR coming across the Bayonne than building a LRT that’ll take just as long to get to St George as the S40/S44 buses do. There’s even more merit to build a cross-island R train to Bay Ridge, BK than this LRT. But instead of real transit improvements, SI fights for a street car. It’s like I’m back in Sacramento again, just without my Hyundai Sonata. BRT. No one in power is talking about rail on the Norh Shore Branch any more. As usual any sane plan has fallen off the discussion table in favor of increasingly outlandish and useless proposals (GONDOLAS!). And the way to do it actually would be simple if not necessarily cheap: just connect the trackage so that the SIR could continue onto the NSB without turning around. Boom, value added. And while I agree that it would not be much faster than the S90 the NSB run would be slightly more useful in Mariners Harbor where the tracks go inland. This should be doable without stepping on anyone’s toes, requiring interagency cooperation, or requiring new rolling stock or maintenance facilities. Anyway you’re missing the point. The SIEDC is obsessed with reviving the Teleport which is why all their favored plans wind up in the middle of nowhere on the West Shore. Or did you think this routing was chosen by merit alone? A key point is density. SI doesn’t have the density to justify these kinds of transit investments. That low density is why SI does NOT have transit; it’s why a lot of people choose to live there; it’s something that Staten Islanders have historically fought to preserve; and as you mention, they’re not talking about upzoning to create the kind of density that would benefit from this kind of transit investment. In SI, the argument against heavier transit has been Staten Islanders themselves. Much of Queens was farmland when the subway went out there. The reality is that if Staten Island was connected to the rest of the region via rail – the areas around the rail lines would be upzoned. The people who want to feel like a suburb could either move to the opposite end of the island (the areas of the the Bronx/Queens/Brooklyn far from the subway look liek their suburban neighbors) – or complete the final move to New Jersey or Florida or North Carolina. NYC has a housing scarcity… Is a subway line going to be built connecting SI to other parts? Doubt it in the forseeable future… There is no reason though that in connecting it to HBLR it couldn’t at least reach the density of Hudson County. No way Jersey City gets built up the way it has without the PATH train. Point being in our region – “if you have mass transit – you can get more dense”. That canard again? Queens’ population doubled in the decade before the subway opened there. I’m sure he has links to the pictures. The subway opened in 1917. The population doubled between the 1920 census and the 1930 census. It grew faster between 1890 and 1900 and 1900 and 1910 than it did between 1910 and 1920. And Staten Island was the fastest growing borough percentage wise for 4 decades after the Verrazano opened and Brooklynites poured over te bridge . Point being – without mass transit in a meaningful way. It CANT continue to grow. Regardless of whether people like it or not – It is a part of the city of NY. A city which has a housing crunch. Saying people in Staten Island don’t want mass transit is beside the point. I’m sure if you find newspaper clippings of the subway expansion to The Bronx and Queens you will find plenty of people bemoaning the loss of both of their pastoral characters. In context, fastest growth in the city means that Staten Island grew 1.6% per year in the 1990s, and has grown more slowly since. Queens averaged 5.8% annual growth between 1900 and 1920. 5.8% justifies building subway through open space; 1.6% doesn’t. If Staten Island wants a rail connection to Manhattan, start with bringing the HBLR over the bridge and stopping at the North Shore Branch (and then reactivate that branch as an SIR line). Or extend the R, maybe. Or, best of all, build a direct tunnel to Manhattan. It’d be expensive, but it’d serve actual people, and not a dead mall. They went and built on all the develop-able land back in the 60s, 70s and 80s. Taking a trolley car through Bayonne would be slower than taking the ferry. Staten Islanders make many trips to NJ…. So many drive because there is no heavy rail to make not driving viable… It need not compete with the ferry. In context – Staten Island was much more built up just before it boomed again with the opening of the Verrazzano than Queens was in 1900. So the growth rate would expected to be slower. No transit project you build anywhere in NYC would cause a 5.8% growth in 2015. Doesn’t change the fact that if Staten Island was connected to the rest of the subway system through Brooklyn (as was supposed to have been done 100 years ago)- you can absolutely make the corridor more dense. Doesn’t matter if some don’t want it. NYC is in need of housing and the needs of a few shouldn’t outweigh the needs of many (such as NIMBY’s killing the subway to LGA). The housing along that corridor would still be “more affordable” (what this mayor loves to talk about) than the luxury housing going up along the Brooklyn/Queens waterfronts along the line the mayor is supporting. I’m confused, doesn’t this West Shore route traverse a couple short stretches of expressway, followed by miles and miles of swamp and landfill? Of all the potential ROW on Staten Island, this seems about the least useful, useful to nobody except those looking to go from Tottenville to Bayonne. I’m a broken record but it’s true: all these dumb plans are about getting workers to the uncompetitive and failing Teleport office park. Any transit utility is an accident. These are the gondola people we’re talking about. It appears to follow the entire length of the West Shore Expressway. There is certainly room to stick a couple of LRT tracks in the middle of said expressway, but… as you say, lots of swamp. Does not directly serve much of any population or job centers there. Would be better off going down Richmond Ave and meeting existing SIR at Eltingville. Would be better off on just about any other route conceivable, in fact. To be brief: Park-and-Ride. Lots of room for commuters to drive ten minutes to the parking lot, then board a train to Bayonne, St. George, or what have you. Lots of cities, including LA and DC, have similar setups. The fact that a West Shore line runs along an expressway and has tons of room for parking lots is to the line’s advantage. Bingo. It’s not about useful transit. Even with tight budget limits, there are good projects to be built on Staten Island: North Shore SIR, HBLR over the bridge to connect with SIR, even a PATH takeover of the HBLR to Bayonne to make it a two-seat all-rail ride from St. George to Midtown. The West Shore is the least developed place in the city. By all accounts, it should be the lowest priority for transit investment, and not the highest. Only if you figure out how to get the trolley car from St. George to the bridge instantaneously. It takes 20 minutes to get from 8th Street, the terminal, to Exchange Place. The ferry takes 25 minutes. They ought to work on SBS first, light rail second. Line up some developers who wants streetcars. It’s working for BQX (at least its being discussed,) it can work for them. You said it Ben. The basic issue is politics. Republican candidate for mayor Joe Lhota took Staten Island by nearly 9% of the vote. Two of three councilors are Republican. The congressional rep is also a Republican. It’s a bizarre rightwing hole surrounded by left leaning donut. One imagines that the majority of Staten Islanders are quite content in their cars – and will obstruct attempts to bring socialist amenities such as more mass transit to their island paradise. Even though its a great idea – and fertile territory – and there’s a few boosters present – perhaps the Mayor has read the tea leaves and decided to spend his energies elsewhere. This is one decision I’d have to say seems easy to support. The $5 million would go to study – but that study would likely be the end of the line – literally. The older I get the more I’m convinced, we must stop trying to give people things they don’t want – and maybe they really don’t need – at least relative to other opportunities. I’m confused – because isn’t this the Staten Island business community that has been requesting the line??? So who doesn’t want this?? My strong suspicion is that SI doesn’t want any transit, they just want to complain about something to get relief in, say, VZ tolls. So they’ll complain about not having transit every so often, to make sure toll discounts are kept or increased. But actually built transit? HEAVENS NO. It’s only useful as a cudgel, not as policy. If you look at The New York Times’ interactive map of the 2013 mayoral election, the first five stops on the light rail line south of the Bayonne Bridge traverse part of the island where he won, in some cases quite handily. Since a vote is a vote whether or not it’s from Elm Park or Park Avenue, ignoring the line completely probably isn’t the best strategy, when it goes through an area that backed you three years ago. 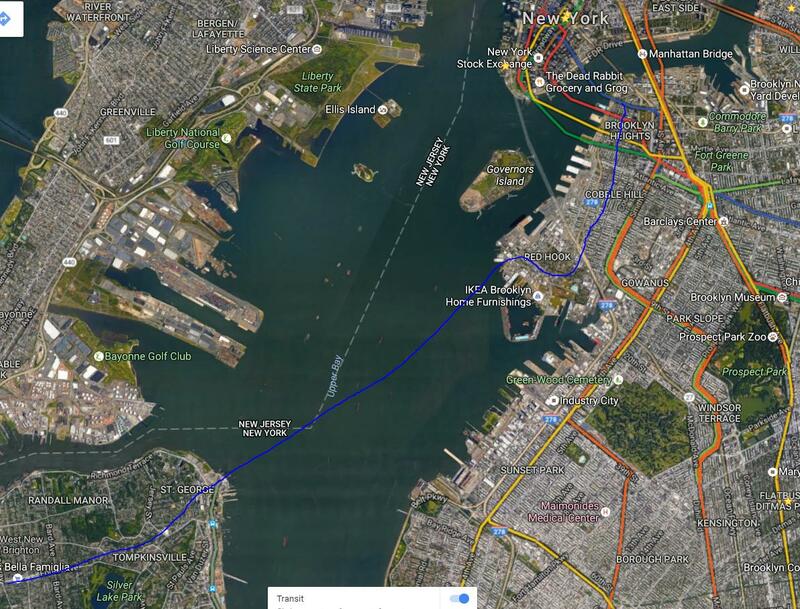 What SI needs is a cross harbor tunnel to lower Manhattan, either as an extension of the E train (if feasable with the infrastructure in the area) or possible the 6 (or the 1) or both? Use a twin-tunnel boring machine (they exist) and build 4 tunnels with an intermodal station on Governors Island. Stage all the construction on governors and use it as the launch site for the TBMs. Not much infrastructure there to deal with, as opposed to the much more time consuming and costly endeavor of digging down and launching a TBM on 2nd Avenue in Manhattan. The E follows the current SIR alignment and the 6 or 1 follows the North Shore. At St George, build a new underground station allowing cross-platform transfers between the 6/1 and E giving SI residents quick, one seat access to the east and west sides, including Penn and Grand Central. NYC needs real added transit capacity and more housing opportunities for an exploding population. I don’t see SI as a suburb disguised as a borough, I see it instead as one of the last major frontiers for development. There are plenty of other frontiers for development. What about all the neighborhoods in Brooklyn full of dumpy old row houses, or neighborhoods in Queens with small single family houses? The density in these neighborhoods could easily be increased by a factor of 3 or 4, and these neighborhoods are vast, capable of housing millions of new people. These neighborhoods in Brooklyn and Queens would be, even with transit access, a long commute from Manhattan. Building a transbay tube instantly makes north and mid Staten Island between 10-20 minutes from Lower Manhattan and Midtown. Underdeveloped areas of Queens are for the most part a long ways from the urban core. I think it’s about building affordable housing that isn’t so far from job centers. Those “dumpy old row houses” form neighborhoods many times more dense than small single family houses. In a sane world, the once-proposed Triboro Rx prescription would become a Quadboro Rx, and it would tunnel jump from Owl’s Head to St. George – a more than reasonable tunneling distance. This would create, in a post FrankenStorm Sandy world, the much needed, and long overdue beltway of the 4 outer boroughs, with more utility than you can shake a stick at. It would mean that virtually ALL the subway spurs that radiate out from Manhattan would suddenly become linked to each other in a way that not only serves us when the cross river tunnels become flooded, but can comfortably reroute us all for weekend service changes, emergency shutdowns, offer alternative routes for all FastTrack projects, etc. AND – the one borough that it seems not to serve – Manhattan – it actually serves the most. Because all of the increasingly long outer borough commuters – Bronx to Brooklyn, Brooklyn to Queens, Queens to the Bronx, etc – that pack the AM and PM rush hour trains, would then have an alternative route that brings them AROUND Manhattan without being forced to cram through it. That could easily translate to 10 or 15% less bodies running through the already overcrowded midtown trunk lines. Another GREAT advantage to a QuadBoro Rx is that since most of its infrastructure is already extant, it means that it could literally be “opened” one station at a time – which translates into lots of political ribbon-cutting photo ops – something ALL politicians can get behind! And as we know all too well, no mass transit projects get built without prominent political advocacy. Maybe when the fans in Richmond can get a one-seat ride to Yankee Stadium – or a two-seat ride to Citi Field – their resistance to a long-overdue subway connection would melt away. And the fact is that with a mega-link like the Quadboro, no matter where they worked in Manhattan, or elsewhere, there’d always be a comfortable subway route to get them there. Agreed… In a sane NY. I won’t blame the whole world since major cities abroad get the idea. Yes, a Quadboro RX line makes excellent sense in my opinion. Maybe TRX should become part of the SIR and operate as part of that system. A connection could be built to the 4th avenue subway as well to connect it to Manhattan. Agre in principle – bit a subway connection to Brooklyn would be the most practical and cost effective. Job growth is exploding in Brooklyn and culturally those two boroughs are very much linked. If the proposed light rail connected to PATH via HBLR that would also be more cost effective. Still the lack of free transfer is still a headache that needs to be dealt with. In terms of upzoning, the route passes through wetlands that need to be protected as part of any solution. As usual there are ideas for “improving transit” on Staten Island. – There are the usual calls from some folks for Staten Island to separate from NYC, or that Staten Island transportation needs should not be examined. There are the usual calls for re-opening 50+ years closed North Shore Rail line! There are usual calls to “build a subway line” from folks scream and complain of the huge costs of building subways in the other boroughs. There are usual pleas for the “fantastic idea” of a direct subway tunnel to Manhattan – as if that idea has never been discussed before! Then there’s the usual gripping about Staten Islanders who drive cars, about how much land is available, the lack of transit and the low (by NYC standards) population. In other places/states Staten Island would be profitable decent place in the minds of many – except here in NYC it is treated as a “back-water” not to be spoken of in polite company. The financial crash of a private subway company (and a related train wreck) brought about the lack of subway access to/from Staten Island and the rest of the city almost close to 100 years ago! The financial crash of the stock market in 1929, besides bringing about the financial downfall of the entire country – rendered dead the building of the Second IND Subway system that among other things would have connected Staten Island to the rest of the city. The period of subway building existed between 1900 and the 1940 – as I have said previously – whatever was not built or operating by then would not get built. The NYC subway would grow thought consolidations and appropriations of other rail lines. True, recently small portions of new construction and additions to current subway lines have taken place – but nothing on the scale of the building of 1900-1940 has taken place since then. The fact is our subways are over a 100 years old, and the decisions that resulted in those transit lines affects us to today! Too many folk on transit forums act as if they just woke up and noticed our transit lines, without understanding the history of what occurred. – As usual there’s the regular pot-shots about the car and its usage of highways, roads and the resulting spreading out of housing. Yes, it is a truly evil thing to want to live in places that have trees, grass and neighbors that are not always on top of each other. Living stacked up on top of each other in Old Law Tenements does have its benefits – I suppose. Or as if the 35+ year history of hourly ferries or the longer term history of pathetic bus transit has had no effect on land use, housing and plenty of other decisions! What is the basic problem with most of the proposals? – The calls for the restoration of the North Shore Railway – beyond nostalgia – is a call for the restoration of a transit line in a place where the land uses that are most in need of better transit is by-passed. The basic reason why there are calls to restore the North Shore Railway is because it is the easiest pathway “available” – not because it would truly serve the users and where they would need to go. The majority of the major land uses – the shopping malls, hospitals, colleges, and many work places are NOT at the edges of the North Shore but rather in the center areas of the island. If one could over-lay on the above map, the population densities of the various neighborhoods one would get a true understanding of the issues. – The repeated calls for a light-rail-line on the western section of Staten Island – again calls for improved transit in sections of the island that have the LEAST population, job-places and housing! The efforts to build this light-rail-line to connect to another light-rail-line for a transfer to the PATH trains to reach Manhattan is NOT an improvement in transportation options. The existence of a rush hours only public bus route to the New Jersey light-rail-line and the lack of heavy ridership over this pathway is indicative lack of ridership needs to be served. In addition this public bus pathway does travel to/from the shopping mall and other job-centers that the proposed light-rail-line by-passes! – The repeated refusal to consider that plenty of Staten Islanders (as well as other borough residents) hold jobs not only in Manhattan, but also in Brooklyn, New Jersey and Queens. Centering transit proposals on the idea that better transit to/from Manhattan solves plenty of needs much too often overlooks other transportation needs. – The repeated refusal to consider that it a heck of a lot easier to build transit lines in places where there are fewer people, than when a place has been built up. Yes, the same can be said for highways and other large scale projects – but the sentiment has truth. – While Staten Island folk (like other borough folk including Manhattan folk) have their NIMBY issues – one has to be mindful of Queens folk and older politicians like Geraldine Ferraro and Alfonse D’Amato. They along with the NIMBY actions of middle-Queens residents that put the kabash to the Queens Super-Express in the 1970’s. So when new transit folk think about the 63rd Street Tunnel and the lack of connections to the southeastern sections of Queens – think of them! – I agree some Staten Island political folk are not good, at all.